Blogging and Food Make for a Great Book! I know, I know the book was published years ago, and the movie also came out a few years ago. I am behind the times, but I think it’s important to not only write about the new books I come across but also the books I come across that have been sitting in my “to-read” pile for a while. 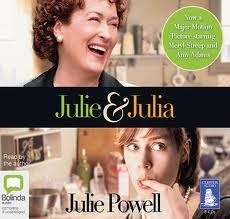 The book I am talking about is Julie & Julia by Julie Powell. Julie & Julia focuses on the blogging experience of author Julie Powell as she cooked her way through 524 recipes of Mastering the Art of French Cooking in a year. As a 25 year old I have never even dreamed of eating many of the foreign items she mentions in the book. I don’t think I have French cuisine in my near future, but it definitely inspired me to actually cook “real food” more than I have been. Many ratings for the book that I have seen from readers on Goodreads show that readers did not seem to like the book finding faults on the author. Readers found her annoying and extremely selfabsorbed. I agree to some extent, but I focused on the challenges Julie faced in cooking so many recipes in such a short amount of time. Every book has some aspects that readers will dislike or disagree with. I can easily see how readers could not stand Powell’s complaints about being busy, and things not working out as they should. I am a meticulous planner and when things go awry it can be disturbing. I took her whining as disappointments she faced along her journey, and although she realizes she can be a bit over the top, I know I would freak out if I took on half as much as she did. The journey from being a blog, to a book, and finally being turned into a movie suited the story well. The movie version starring Amy Adams, Meryl Streep and Stanley Tucci was endearing to the movie goer. It is one of the few instances that after watching the movie and reading the book I am happy with both instances, and not disappointed with the job done on either one. It was extremely beneficial to include Julia Child’s story in the movie, as it made the film all the more enjoyable because it balanced out the melodramatic scenes with a romantic sense. Why can’t more movies follow the book so closely? It makes me sad that some movies stray so far from their origins.